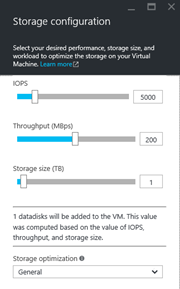 We’re excited to introduce a new, simplified configuration experience for SQL Server in Azure Virtual Machine. You can now configure SQL Server connectivity, performance, security, and high availability when you create a SQL Server VM in the Azure Portal. Either accept the default recommended settings or modify them as you want. No more time consuming manual configuration after setup! 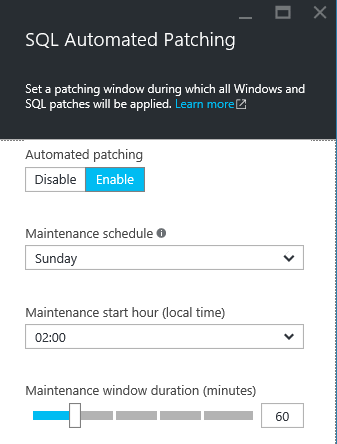 This new simplified configuration experience builds on our earlier features to speed up the configuration of SQL Server: Automated Patching, Automated Backup, Azure Key Vault Integration. We have consolidated these SQL Server specific features under a new “SQL Server Configuration” section in the Create Virtual Machine Portal experience, and added the ability to configure SQL Server and VM storage for a target workload, configure SQL Server connectivity, and configure SQL Server to store encryption keys in the Azure Key Vault. 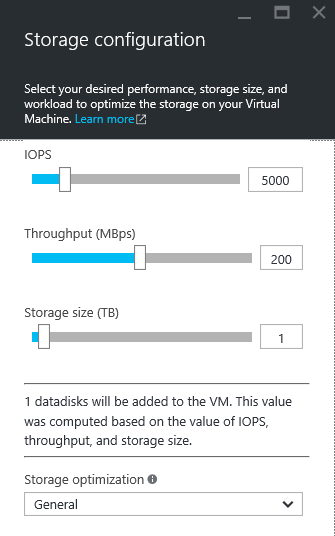 To try out the new configuration experience for SQL Server Virtual Machines, go to the Azure Portal. In the Azure Marketplace, you will find any version of SQL Server you want. Select the new Resource Manager deployment model and click Create. In the Create Virtual Machine blade you will find the new SQL Server Configuration section will all the SQL Server specific features. In the past, configuring SQL Server connectivity was not trivial. For example, to connect from on-premises using SQL Server Management Studio (SSMS) you had to Remote Desktop to the VM, open the SQL Server port in the VM firewall, open SSMS and enable SQL Server Authentication, and create a Public Azure endpoint for the VM. Now, you can simply choose SQL connectivity over the Internet and enable SQL Server authentication from the Portal. 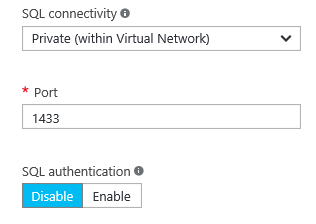 In addition, you can choose SQL connectivity within an Azure Virtual Network, or still allow it only within the VM. 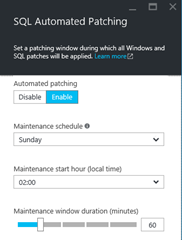 Automated patching allows you to specify a time window to patch Windows and SQL Server. This allows doing this during predictable times without impacting your workload. We have heard so many customers asking for this feature that we have enabled it by default to 60 minutes on Sunday at 2:00 am. Of course you can change these values as you want. 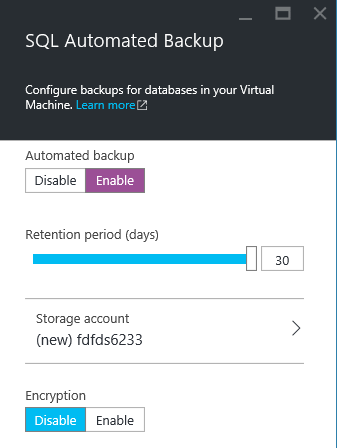 Automated backup allows you to automatically backup all databases in SQL Server based on your workload and specify their retention time. We don’t enable backups by default as everyone has different requirements. 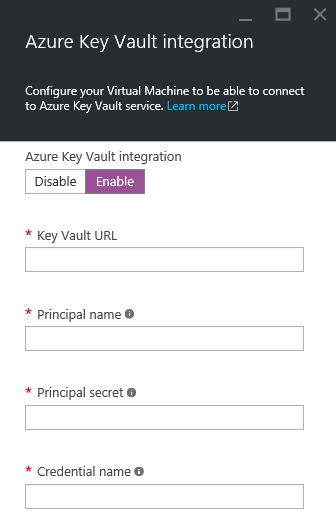 Earlier this year we announced the Azure Key Vault Integration feature. 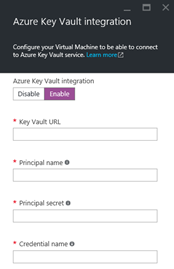 This feature simplifies configuring SQL Server to store encryption keys in the Azure Key Vault. We also added this option to the portal experience to further simplify this. 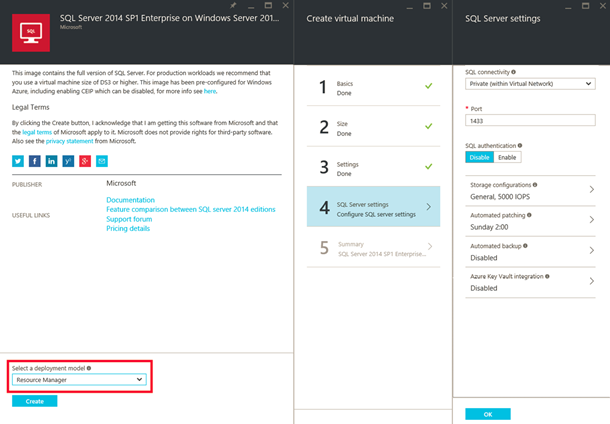 We have introduced a new, simplified configuration experience for SQL Server in Azure Virtual Machine. No more time consuming manual configuration after setup! Try this new experience today in the Azure Portal. For more details, check out the documentation.